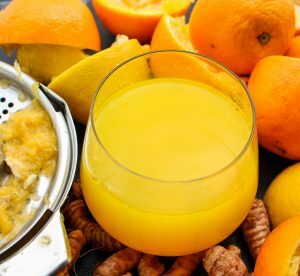 With winter fast approaching we all need a natural vitamin C and immune system boost and this delicious Turmeric Tea recipe fits the bill. You can customise this tea by adding as little or as much turmeric and ginger as you like, by adding cayenne pepper or by leaving the honey out for example. Turmeric will stain everything it comes in to contact with so wear gloves when preparing it and be careful not to stain your worktops, teeth and mouth as I frequently do (I now use a reusable straw). Be sure to add black pepper as it helps the body absorb the curcumin present in the turmeric. Get the kettle on! Juice the orange and lemon into a tall glass, add the honey and black pepper then set aside. Using a microplane or fine grater, grate the turmeric and ginger into a jug or mug then pour in boiling water. Steep the turmeric and ginger in the hot water for five minutes then sieve into the juice mix and serve with a straw.